We are all going mad (other than me). The latest corporation to join the ‘green’ movement is Bridgestone, which proudly announced that the grooves in the F1 race tyres for Japan would be green. Are they pulling my leg? And yours? I suppose it is biodegradable paint. “New rule changes, alongside the support for awareness-raising initiatives such as the ‘Make Cars Green’ campaign, will change the face of motor sport and place it at the very heart of environmental developments in the automotive sector,” explained Max Mosley, president of the FIA, Formula One racing’s governing body. He’s pulling our legs too. The world has entered this ‘guilt’ phase. As Chicken Little said, “The sky is falling” (through the hole in the ozone layer), but “I’m not to blame! It’s the other polluters! I’m green.” So we have the ludicrous situation of Honda claiming that its F1 cars are promoting green technology and now Bridgestone with its green tyres. Total fatuous nonsense. When you sit down and think about it rationally, just how much does F1 affect the polar ice caps? The words ‘bugger’ and ‘all’ seem to leap into the forefront of my mind. Particularly when you contrast the two days of running every fortnight against the 24 hours of baht buses all day and every day in Thailand. Give us a break! Give us good clean racing with plenty of passing, and forget the green rubbish. Leave that for governments (and Honda and Bridgestone). Last week I noted that a maker of aeroplanes decided to go into production of cars, after WW II. The body was made of alloy, with thicker panels on the top of the front wings, where mechanics would lean during servicing. The engine was a two liter six cylinder which was appropriated from a German auto manufacturer as part of the war reparations. The body shape was very aerodynamic and in tests done in 1973 (20 years after the car had been discontinued), only four current production cars were found to have marginally better drag coefficients. What was this car? 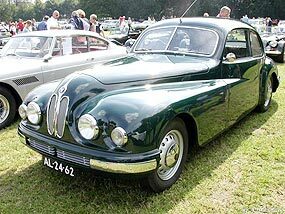 Answer: it was the Bristol 401, with the old BMW six cylinder engine. So to this week. Not all ‘replicas’ were made by other manufacturers. Sometimes the original manufacturers built their own replicas. Confusing? There was one famous ‘replica’ which came out post WWII and the design team and most of the mechanicals were ‘liberated’ from Germany. This replica was very expensive and cost six times the price of an MG TC for example. It also came third at Le Mans, and after that effort, the factory then made its own replicas of the Le Mans car. What was the name of these cars? Think hard, it’s not too difficult. News is through that Peugeot is to be re-launched in Thailand, following the dividing of the Yontrakit Group, with the Peugeot brand being taken over by Ponkrit Leenutaphong and his brother Phasupong. Their father Attaphong Leenutaphong and uncle Attaphorn Leenutaphong founded the Yontrakit Group and which has been the authorized importer and distributor of Audi and Volkswagen, Citroen and Peugeot, Skoda and Seat. It recently also took on Kia and Mitsuoka. 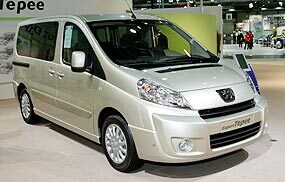 An assembly plant is to be built at Lat Krabang at a cost of 100 million baht to build Peugeot Expert 11-seat vans from semi-knocked-down (SKD) kits. The Leenutaphong brothers say that the Expert will be the first locally built model and the plant will assemble about 200 vans each year. They will also be exported to Malaysia and Indonesia to take advantage of low tariffs under the Asean free trade area (Afta); however, how that fits in with the Malaysian distributor the Naza Group is not explained. The report says that all Peugeot centers will adhere to the company’s uniform-look global ‘Blue Box’ template, with original parts and services, Peugeot Planet System (PPS) diagnostic equipment and a 24 hour call centre. Peugeot (France) is not investing capital in the new Thai venture, but is supporting its distributor in operating systems, especially software, and it will work with other Peugeot producers in the region on coordinating exports (which is where Naza also comes in). Well, we learned (yet again) that being a steward requires the FIA appointed office bearer to wear a red hat, and preferably a red jacket, trousers and shoes to go with it, and a small cavallino rampante. Let’s look at the steward’s decisions. First off, the first corner incident. Hamilton out-brakes himself trying to get back the places he lost in the drag from the line. Steams up the inside and totally outsmarts himself and loses yet another few places, ending up fifth. All the other runners beside and behind him manage to miss the McLaren, some using the wide run-off area on the outside of the corner. A typical first corner melee, from which Hamilton gained no advantage, in fact losing four places. Yet Hamilton was given a drive through penalty. The second incident which interested the stewards was on lap 2 when Hamilton spun after being hit by Massa (Ferrari), who had four wheels in the dirt on the apex of the corner. Hamilton lost another 15 places, dropping him back to 18th. Massa gained an advantage. Massa was then given a drive through penalty, which dropped him back to 13th. The third incident they investigated was when Bourdais (Toro Rosso) came out of the pits and Massa attempted an outside pass on the tight right-hander, tapping Bourdais and ending up spinning. Massa lost track position to Bourdais, but that was all. Bourdais was then given a drive through penalty, elevating Massa to seventh and demoting Bourdais to 10th. There was a fourth incident, which was not (apparently) investigated, when Massa passed Webber (Red Bull) by using the exit lane from the pits, with all four wheels now off the racing surface (the pit lane exit is not part of the racing surface). Massa scored an advantage. Rule was broken, but no action from the stewards. It is time the FIA stewards took a leaf from Rugby League rule book, called the ‘advantage’ rule. If an infringement of the rule does not give the infringer an advantage, then just play on. It would certainly be more fair than the current application of rules by the FIA stewards. So to the race. I take my hat off to the Sulky Spaniard. He and Renault deserved that win. Alonso did not have the fastest car, he just drove it better than all the others. He was definitely my driver of the day. Second place for Robert Kubica (BMW) was also well deserved, and his defense of track position against Raikkonen’s Ferrari was superbly gritty stuff. Bourdais drove well, eclipsing Vettel for once (but will it be enough for him to retain his race seat in 2009?). After that, the rest were mediocre at best to downright pathetic at worst. Hamilton and Massa drove like amateur weekend racers attempting to win at all costs, and it cost them (other than two championship points gifted to Massa by the stewards). Piquet threw away his (and Renault’s chances) again. At least this time he didn’t hit anything hard. The only way he will be retained at Renault is if he buys the seat (not unheard of, either). Trulli (Toyota) put in a solid, but uninspired, race, whilst Glock bent his sister car, but crasher of the day was (yet again) David Coulthard. The crane drivers will miss him next year. Beating a Ferrari to the finish a second time - death penalty.